We have had these for years now. Love them!! Subtle color. Very spa like. Kraus BG1517 17 inch Stainless Steel Kitchen Sink Bottom Grid, Bumpers - 12-4/5 in. x 14-4/5 in. Add a touch of elegance to your bathroom with a Kraus frosted glass vessel sink. Handcrafted from tempered glass, this modern bathroom sink coordinates with a variety of decor styles. A freestanding basin design creates a dramatic look with contemporary appeal. The smooth, polished surface is beautiful and requires minimal maintenance to keep clean. This versatile sink can be installed above-counter for all your stylish bathroom ideas. Sink Dimensions: 14" x 5.5"
Some glass vessel sinks are very green even if the glass is to be untinted. This is very subtle and clean. Pretty - and the size fits well in a very tight space. I embarked upon a home-improvement project that was (almost) over my head - I purchased this sink for the counter-top that I tiled myself...we saved a ton of money and our powder-room now looks terrrific. The hardest part was finding a drill bit and drilling through the tile to install the sink and faucet, I had a handy neighbor help me (we had to drill little holes and then go in with a 1 3/8 bit because you need a 1 1/2 inch bit that I could NOT find anywhere in Cleveland without a contractor's license. )The sink is very heavy and looks terrific! It is described as small, but it is the perfect size for my needs -our counter-top measures 19 x 36. I had looked at sinks all over the internet and this was by far the very best deal - THANKS! The color of the sink is perfect. It reads a little like a pale sea glass. Lots of compliments! Easy to wipe clean. We looked all over for two vessel sinks this size.to create a double vanity from a single. These were perfect and give us maximum counter space. Very good quality at a great price. I have no plumbing experience, but this sink was super easy to install. Does not water spot and is easy to clean. A very elegant update for my powder room. love the look of this sink, exactly as it is shown on the website, very heavy. gives my bathroom the contemporary feel I was looking for. The vessel received is exactly as described. The quality is exactly as expected and I am quite pleased. The packaging was outstanding and the item arrived safely. Product instructions are clear and easy to understand/read. I would purchase this item again for the next bathroom remodel! It is in my guest bathroom and it looks beautiful We have been using it for a few days and are pleased. A wonderful, upscale-looking sink. 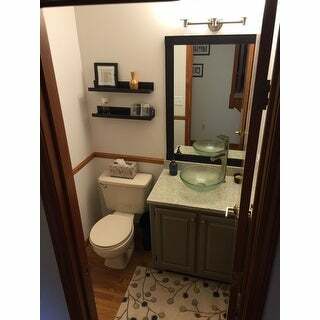 Perfect for our basement bathroom addition at a fraction of the cost of the plumbing stores. Super affordable and provides an expensive look. Because it's clear it does need to be wiped out every other day but it's in a half bath and works for us. I would with out a doubt, get another sink from O.co. This is not my first one and it certainly won't be my last. I have recommended the site to many people. I just wish they would ship faster. I loved that product. It was exaclty what I was expecting. This sink is just the right size for a half bath application. It is not installed yet but I know it will look great. "I bought a vessel sink and now I need a drain for it, are they all standard drains or do I need a specific one"
They are fairly standard, but you should measure your drain opening, as there are a couple of available sizes. 1.75 inches is most common.